It’s been a glorious day here and we spent most of it outside. This morning saw DH take DS and the light-duties pup to the park while I nipped off to do a small grocery shop followed by a drop-in at Starbucks to collect 2 lattes to go. The poor pup didn’t enjoy being in the park on his lead! 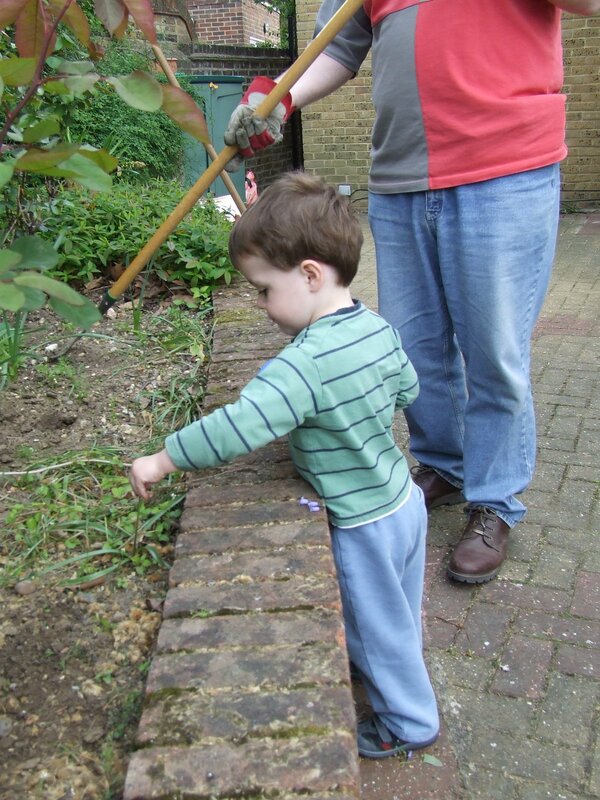 This afternoon DH felt inspired to tidy up the garden, front and back and DS felt inspired to help him!! In reality he managed to dead head the still flowering wild bluebells! He had great fun discovering his many distorted reflections in the back of the car, kept him entertained for ages! Daddy’s little helper! Wait until he finds his reflection in a shop window!! I love the reflection shot even if he has got 3 heads. S’s song was Your So vain by Carly Simon as he looked in every shiny surface going…even a spoon!! !